How Far is SG Kurunji Gardens? 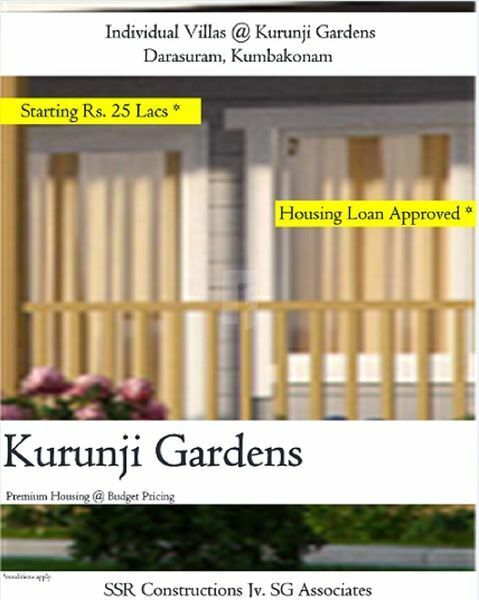 Kurunji Gardens is a Budget residential project developed by SSRC JV SG Associates at Darasuram, Just besides Darasuram to Patteswaram Main road, Kumbakonam, Tanjore Dist. Tamil nadu. The project offers well designed 2 & 3 BHK houses and is well connected by various modes of transportation. The beautiful Airavateswarar Shiva Temple, the powerful Patteswaram Durgai Temple, famous Swamimalai Murugan Temples are in close proximity to this location. . This location is ideal one for all investment purposes since its well placed between fast developing localities.